This isn't the first time Bender's played God; "Godfellas" had him tending to a colony of intelligent life that evolved on his torso while he floated through space. That episode was about how difficult it is for any potentially divine being to affect the lives of mortals without inadvertently killing them. "Overclockwise" goes in a different direction. 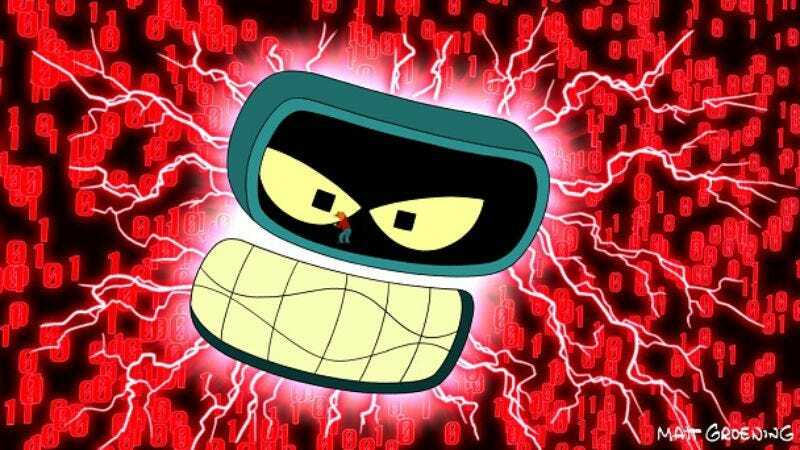 The premise, that Bender becomes super-powered after Cubert overclocks his processor, is a good one, and the idea of Bender becoming nearly omnipotent has a lot of possibilities. The episode itself, though, is a bit of a mess. There are a lot of excellent moments here, but the story gets lost for a while in the third act, with a courtroom climax that doesn't make a whole lot of sense. Then it rebounds again in the final moments. Some episodes are greater than the sum of their parts; some aren't. This one feels like the latter. At least the show finally directly addressed the Fry/Leela problem. I don't think the Futurama writers have been using the past two seasons to build up to this moment; the inconsistencies between Fry and Leela have always been more about what makes sense in one particular story without regards to any kind of "master arc." (I understand why people have a problem with this, but for some reason, despite being invested in both characters during the show's initial run, it's never bothered me. I think "The Devil's Hands Are Idle Playthings" was just such a perfect conclusion that, to me, the two of them will always be somehow frozen in that last moment, whatever else happens.) Still, it's a nice lampshade scene when Leela takes Fry aside for some relationship talk, to confront him with the fact that their on-again/off-again relationship is too indistinct to go anywhere. After doing some thinking (which includes reading the article, "Is Your Dead-End Relationship In A Rut? "), Leela decides to move on with her life, leaving Planet Express and Fry to go sell real estate on the edge of the galaxy. This breaks Fry's heart, but he's got other worries: namely that Cubert and Farnsworth are both in jail due to Mom's machinations, and Bender has disappeared to be a super genius. "Overclocked" doesn't hold together well in retrospect. The plot with Mom and her boys is mostly just there to give everyone else something to do while Bender levels up and Fry mopes. Cubert amps up Bender's processors so he'll be better at video games, so Bender beats Mom's boys at World of World War II 3, and Mom decides to have her revenge. It's all silly, which isn't so bad, but while there are funny lines, the story itself doesn't go anywhere beyond the obvious. Cubert and Farnsworth are arrested, so we get a court scene, and the court scene has to end with some trickery, which it does, even though it's not very good trickery. (Why does Mom come up with her brilliant plan to ensure Farnsworth's conviction after the jury returns with its verdict? Does she think they'll re-deliberate?) And Bender becomes super-smart, so we get him playing some super-smart tricks and giving some super-smart speeches. There's only one trick, really, but it's cool: using Zoidberg to take out a bunch of hunter-bots via a badminton net and a microwaved turkey. Maybe I've been spoiled too much by other stories about super-smart people, but this one just seemed to sort of give-up by the end. Bender comes back to the courtroom for reasons that even he can't understand, and then Mom catches him and puts him back at his factory presets. It could be this is all a subtle point about how even smart people need a place to call home; after all, Leela does come back, without Fry or anyone else having to convince her of anything. Then she and Fry read over the future of their relationship, a future Bender wrote down before he lost his brains. It's a sequence that will probably tick off the same fans that the Fry/Leela storyline might've placated; I doubt Fry or Leela will make overt references to the history for the rest of the show's run. But in and of itself, it's a funny, sweet scene, and there are enough moments like this scattered through the episode (most of them more funny than sweet) to help "Overclocked" hold together better than it probably should. More than anything, this feels like an episode that wants to be something more, that keeps pushing against some other level, a level it can't reach, either because the writers don't want to take big risks, or because the design of the show prohibits that substantial a change. 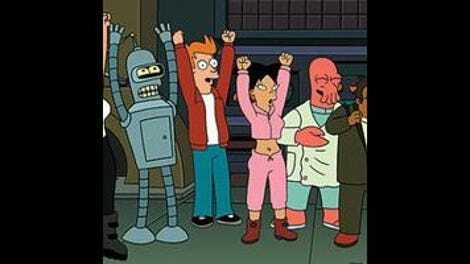 Or maybe it's just a mess because Futurama can't really blend its funny with its feeling quite as well as it used to. The best and worst you can say is that "Overclocked" has its moments. It's just not sure how to use them. So in the future, video games will be basically what they are now, only a little bit worse? I wanted more of Giant God Bender. Fun story possibilities, but mostly just a really neat design. There's a Mom version of the iconic Farah Fawcett poster. "What did I teach you about tinkering with machinery?" "How. You taught me how." "Oh God, I clicked without reading!" "And I slightly modified a thing that I own!" "We're monsters!" Nibbler On The Roof. Heh. "She always liked not being observed with a telescope."